The Trachea is a long wide tube occupying the middle line of the neck, and separated from the spine by the oesophagus or gullet. It extends from the cricoid cartilage of the larynx to about the fourth dorsal vertebra. It is about 3 feet in length and 2 inches in width. It is composed of about fifty C-shaped pieces of cartilage, each of which is converted into a ring by a strong muscular and elastic band stretching across from one side of the cartilage to the other. Elastic and fibrous membranes also extend between the edges of the rings, so that a continuous tube is formed, and this is lined by a mucous membrane the innermost layer of which is composed of epithelial cells having upon them fine hair-like processes termed cilia. Towards the lower part of the trachea the rings are replaced by irregularly shaped fragments of cartilage (fig. 200). The cartilaginous frame-work effectually prevents the trachea from being closed by any moderate pressure that may be exerted upon it, and air is consequently always capable of reaching the lungs without interference. The entrance of food or of any foreign body into the trachea is jealously guarded against, and it is only when these parts are, so to speak, taken by surprise that such an accident can happen. In the first place the mucous membrane of the whole of this region is rendered extremely sensitive to touch by the distribution of the superior laryngeal nerve, which is a branch of the vagus. Then in the act of swallowing, the whole larynx and trachea are drawn close up behind the tongue by muscular action, whilst at the same time the epiglottis is drawn downward to meet them, and in this way the opening into the larynx is closed against the entrance of food. At the same moment the vocal cords are brought to-gether and the space between them reduced to a mere chink; whilst lastly, if, in spite of these precautionary arrangements, a fragment of food should by chance enter the larynx or trachea, it is immediately expelled by a violent expiratory effort or cough. Fig. 199. - The Larynx, seen from above. A, Cricoid Cartilage. b, Long Cornu of Os Hyoides. c, Short Cornu. D, Spur Process. 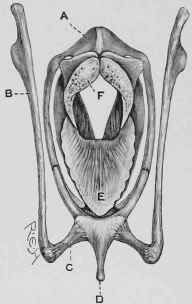 E, Epiglottis. F, Glottis.